Whenever someone crashes through the barrier on the side of an overpass, it's never good news. When Matthew Hamilton, 38, drove his truck off the side of a bridge in Beaverton, OR this weekend, luck — and a really sturdy rear axle — saved him from plummeting onto the road below. Hamilton, who was charged with driving under the influence, was rescued from his truck by a firefighter on a ladder. 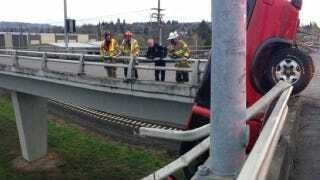 But the dangling truck stopped traffic as rescue workers organized a crane to pull it down from the side of the bridge. Hamilton sustained only minor injuries from turning his truck into a life-sized wall decoration, so he'll have to go to jail as soon as he gets out of the hospital. Luckily, no one else was hurt.